When the Russian armies poured across Germany’s eastern borders in the beginning of 1945, the Army High Command introduced a major improvisation, the LEUTHEN Project, which constituted a radical change in the Army’s replacement and training policy. To the German mind Leuthen, a small town in Silesia where Frederick the Great had won a major battle with improvised forces, was the symbol of a victorious last-ditch stand. It was probably for this reason that the Army selected the term Leuthen to designate this project. The plan foresaw that all training units of the entire replacement army were to be transferred and assigned to the field forces as soon as the code word LEUTHEN was transmitted to them. In immediate proximity of the front these training units were to be subjected to a more realistic combat training than they could possibly receive in the zone of the interior. Moreover, they were to serve as security forces in rear area positions or defense lines. The original idea was therefore both sound and practical, but it should have been put into effect much sooner, when the front was still stable. What actually prompted the execution of the LEUTHEN Project at that late stage, whether it was still the original intention as officially proclaimed or rather the steadily deteriorating situation on the fighting fronts, must be left to conjecture. In reality all the LEUTHEN units were immediately committed and thrown into the thick of fighting in critical situations. What did the LEUTHEN units look like? In every Wehrkreis there were a number of training and replacement units of various arms which were under the command of division staffs. The men who had completed their training and were ready for combat duty were in the replacement units. The training units were composed of recently inducted recruits who were to be prepared for combat by undergoing an eight-week basic training course. Upon receiving the code word LEUTHEN, the division staffs were to move out with all training units that had completed one to seven weeks of training. One of the units alerted in this manner was the Special Administrative Division 413 which consisted of several training battalions, a regimental headquarters, an artillery battalion with an odd assortment of guns, and elements of an engineer and a signal battalion. As a tactical unit, the division was really no more than a reinforced infantry regiment commanded by an elderly general with a small staff. Needless to state, it was absolutely incapable of any combat assignment. The cadre up to the division commander consisted of personnel unfit for combat because of sickness, injury, or for lack of tactical qualifications. Most of the noncommissioned officers had suffered combat injuries of such severity that they were barely fit for garrison duty. Some of the men were entirely untrained, others had completed one half to three quarters of their basic training. Some of them were unarmed because the number of weapons provided for training units did not suffice to arm every soldier. In addition, the various formations had absolutely no organic transportation. There were no more horses than those needed for the normal garrison functions and the division had no field kitchens since the food had always been prepared in the permanent garrison kitchens. The clothing and equipment were equally defective. Quite a few soldiers, for instance, could not be issued garrison belts. In general, everything was in exactly the condition to be expected from a home station in times of stress where shortages have become the rule rather than the exception. When the LEUTHEN division moved out it was therefore no more than an improvisation of the poorest sort. This might not have mattered so much had the division undergone a rigid training schedule far behind the lines. But even while it was on the approach march to its destination, one of its battalions was shifted from the Main River valley to Hammelburg where a small enemy armored force had broken through. The remainder of the division was immediately sent into combat and annihilated. In summarizing, one may state that the LEUTHEN Project was doomed from the outset because it was applied in a situation for which it was entirely unsuited. In view of the extremely heavy losses of manpower, the shortage of weapons, and the precarious condition of the transportation system, the situation of the German Army became so critical that the need for improvisations grew even more urgent during the last few weeks of the war. The organizational improvisations of that period were a far cry from those introduced during earlier stages. In many cases the selection and training of replacements was makeshift. Equipment of all types was totally inadequate and consisted of whatever was left over or could be picked up. Since no guns were available, the organization of new artillery units was practically impossible. Whatever new infantry units were organized during this period were of limited capability in the field. In Bavaria, for instance, the last regular activation of a new infantry division took place in November 1944. What followed thereafter was pure improvisation, not so much because of the shortage of trained replacements, but because of the inadequate supply of weapons and equipment. Although the organization of new divisions had become impossible, replacement units were sent to the front until the beginning of March 1945. Then even this function could no longer be accomplished. 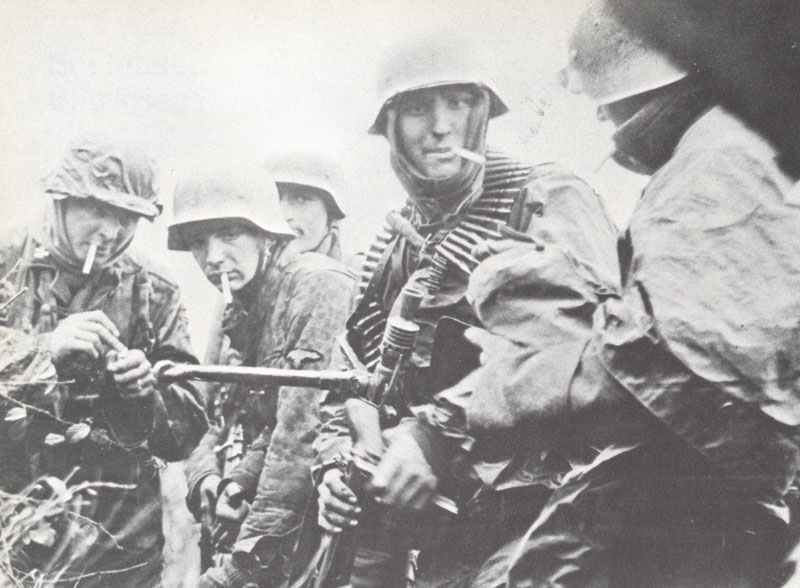 Each Wehrkreis assumed command over its replacements, organized a few emergency infantry battalions and transferred them to the nearest tactical command. Many well-trained soldiers were still available but, because of the serious shortage of infantry heavy weapons, it was no longer possible to organize entire machine gun companies. The battalions were therefore composed of a small battalion staff and four rifle companies. Each company had one machine gun platoon with two heavy machine guns and a few locally requisitioned wood-gas-burning trucks, one of which carried a cook stove. The few artillery battalions organized during this period were composed of a great variety of guns. No two batteries were alike and every section had guns of different caliber. During that period occurred a very significant incident which demonstrated the effects of the improper utilization of administrative personnel. Several first-rate panzer battalions were in the process of rehabilitation at the Grafenwoehr troop training grounds in Bavaria. When enemy armored spearheads approached the area, a corps commander responsible for a near-by sector of the front ordered the staff of the training center to assume the tactical command of the panzer battalions and stop the enemy advance. The commander of the training center was a general well along in years who had always handled administrative assignments very competently but had never during his long career commanded a panzer unit. His staff was composed of elderly reserve officers and ordnance specialists. 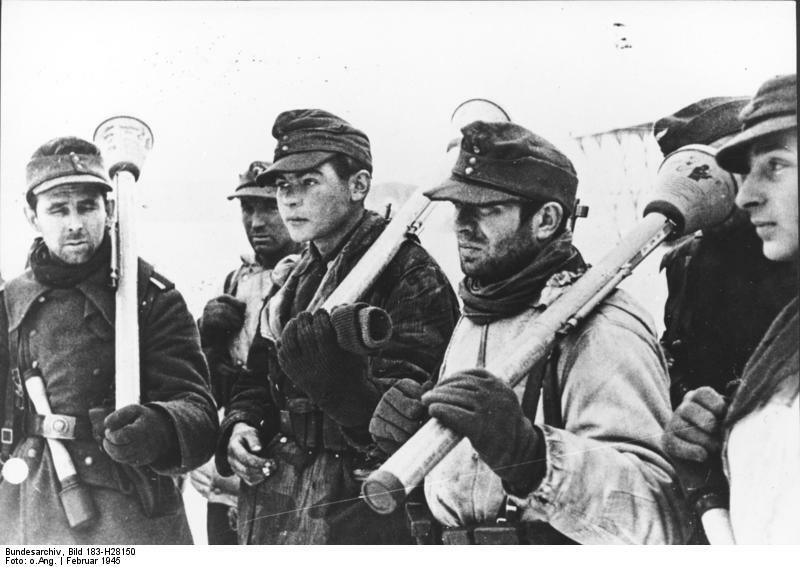 Their leadership spelled disaster for the panzer battalions. The numerous organizational improvisations introduced during that period were only stop-gap measures applied in time of extreme emergency. Since most of them were adopted to overcome purely local critical situations they are of little consequence in a study of this type. This entry was posted in Armies, German Units by MSW. Bookmark the permalink.